Portable office trailers are for sale everywhere in the United States and Texas seems to have some of the best deals available if you are searching for temporary or even permanent space for your business. Why Texas? Portable office trailers, or as many people call them "mobile office trailers" have been rented and purchased for decades by schools, churches, construction companies, refineries, recreation centers and so on...and after time many of these businesses no longer have a need for the portable trailer. The end result is much like a good used vehicle... they are sold as is for a great price. Markets like Austin, Dallas, Galveston and Houston have thousands of portables in literally all sizes and configurations - available for you to buy at rock bottom prices. Hello and Happy 2018! Just a quick post today about donating your used modular classroom to a church or school in need. There are organizations looking for modular classroom space across the country and many public schools have portables waiting for a new home. If your school has 24'x40' or 24' x 60' modular classrooms to donate or sell for a low price please call me today at (800) 806-7485. Many of the school programs I deal with are in need of assistance and having a modular classroom donated sometimes is the difference between education success and failure, particularly in areas that are economically challenged and lack quality school housing. A modular classroom can make a huge difference in any type of school program - but in many cases the costs are simply out of reach. Thanks and please share this post with anyone that may be able to help. Hello and Happy New Year....if you have just landed on this post from our sister web site iModular.com - congratulations. While we work on the iModular.com web site we will use this page to help you find the modular building, portable classroom, mobile office trailer or any other type of modular space you may want to rent or buy. Thanks again and feel free to call me (Matt Banes) directly for help finding the modular space you need. Toll free (800) 806-7485 or use the Compare Price Quote tool and find a great deal today. Learn how to be a smart modular classroom customer. Shopping online to rent or buy a modular classroom is much like shopping for a car - there are many advertisements that follow you around from web page to social media and back. In some cases these advertisements are set up by companies with no experience in designing, selling or installing modular classrooms yet they want to connect you with companies that can help you. It's the middle man model and it can waste a lot of your time and money. The difference between these services and calling me can save you a bundle of time and, in many cases help you become the ideal client for a modular classroom supplier - and this puts you in the driver's seat as a buyer. Why me? Well let's just say that I'm a "life time member" of the modular building business and have learned what works and what doesn't for literally every type of modular classroom project. Sharing this information with school facility managers, church administrators and daycare operators is now what I do for a living and it's rewarding to see happy modular building customers. 1. How to calculate the amount of space you need. 2. How to select the ideal site to install your modular classroom. 3. What you need to know about obtaining a permit for a modular classroom. 4. Whether to rent or purchase a modular classroom. 5. If a new modular building or used modular is best for your school or church space need. 6. How to optimize your buying power and shop for the best supplier and best price. 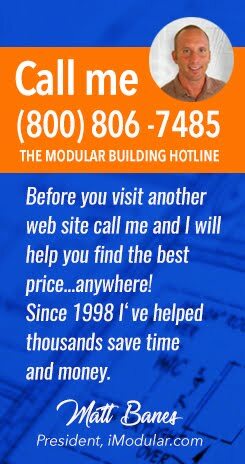 Give me a call...I'm here to help you "piece" together your modular classroom project!